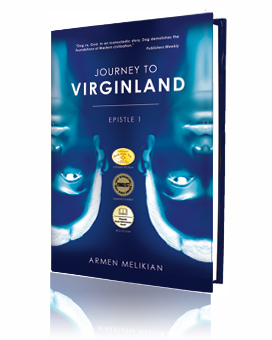 In Journey to Virginland, the critically acclaimed novel by Armen Melikian, history itself becomes a protagonist, as dynamic as the book’s gallery of characters. At the heart of Melikian’s historic fiction is a passion for unorthodox truth and esoteric knowledge, together with an abiding belief that humanity must be the ultimate author of its own destiny. Thus Melikian’s historic fiction is predicated on a life-affirming ethos of freedom: the freedom of societies to carve out an ideal path; the freedom of the individual to rebel against the status quo and convention, in an effort not only to restore trampled rights, but shed fresh light on history, help heal collective wounds, and leap into a better horizon. In Melikian’s novel, a panoply of historic figures – including Jesus, Lenin, Osama bin Laden, and George W. Bush – come to the fore, playing key parts in the author’s elegantly incisive meta-historic narrative. With Dog, his antihero, leading the charge, Melikian uses various mechanisms to expose the grand sham of organized religion as well as a host of philosophies that underlie the human condition in the 21st century. In the author’s capable hands, historic fiction hits hard: a stock-market crash can send the world topsy-turvy and a lone cleric can unleash a war. Through his distinct approach, Melikian presents an ebullient vision of human transformation, resonating on the planes of the spirit, sexuality, and the intellect. Looking for thought provoking historic fiction? Get your copy of Journey to Virginland today!